Whenever we talk about media and diversity, it's usually bad news or standing ovations being given for their baby steps in nonwhite cultural exploration. This is going to be the latter. When DreamWorks announced Home as their next project, we were beside ourselves with glee over the pure and simple fact that it was starring a young black girl. If the trailer for Home is any indication, we were right to get excited. Speaking as a black woman, the protagonist, Tip, seems like everything I could have hoped for and more. It all started with her design. 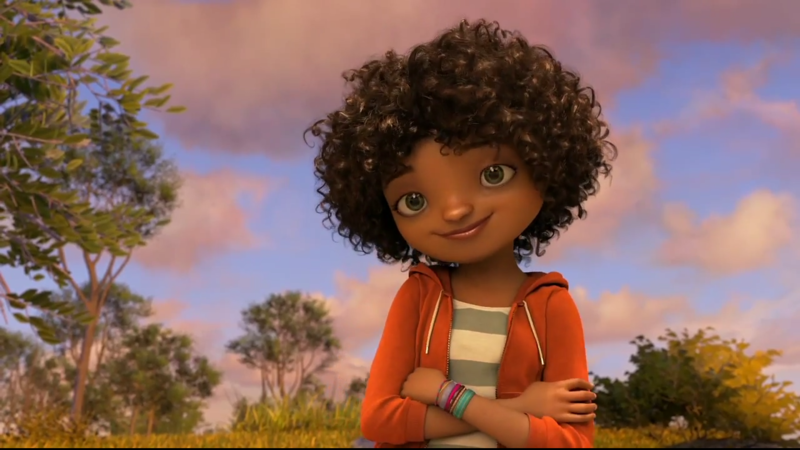 Tip wears her hair natural and, as any black woman who has ever broken a comb in their hair can tell you, DreamWorks got it completely correct. The nest of curls that she wears throughout the whole trailer only adds to her adorableness and is winningly and subtly contrasted with her mother, who has processed her hair, showing both styles as equally beautiful. And yet, by making our protagonist the one with the natural hair, DreamWorks is showing that style as valid and gorgeous in a way that a lot of movies and shows don't. Then there's the plot of the film. Tip, voiced by Rihanna, teams up with an alien named Oh, voiced by Jim Parsons, to save the world and parallels are drawn between herself and Oh as they try to figure out what the word home means to them. It never feels like Tip is simply a supporting protagonist or a second fiddle to Oh. Instead, it feels more like he's her sidekick or that the two of them are equals, as the trailer makes it seem like whatever mission he is trying to complete would be indispensable without her. It's easy to say that we need more protagonists of color in the media, but even more than that we need more protagonists of color written well. That doesn't mean perfect or flawless; I mean real, flawed, multifaceted characters of color in huge roles in films and television. Tip headlining this movie is a great step in the right direction, especially considering the film is geared toward children. More than anything, children need to see more representations of themselves and their culture in the media. Home will do for black children what Zoe Saldana's Book of Life will do for Hispanic children and what Disney's Big Hero 6 has the potential to do for Asian children: give them a hero to look up and relate to who actually looks like them. As someone who didn't get that until The Princess and the Frog came out when she was too far out of childhood to enjoy the same impact, that's incredible.